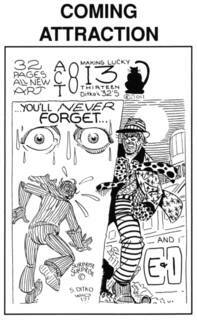 ...or to give it what looks to be the full title, ACT 8 MAKING LUCKY 13, THIRTEEN, DITKO'S 32S. That's the next new Ditko in the series, and as you can see from the cover, we get some Grey Negotiator and some Madman, plus a classic Ditko visual motif in that close-up of the eyes. Coming soon, ordering details over here for this and previous Ditko works in print.